Davis claims that their algorithms are so advanced that the system only suggests trades that will end in profit. However, despite his claims of earning traders thousands of dollars a month, we have yet to see such results. We have reasons to believe the Option Bot 2.0 is not all it’s cracked up to be. 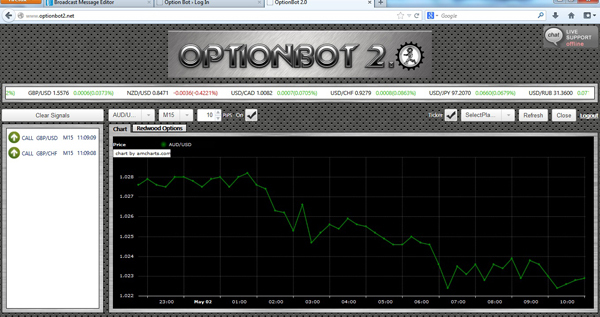 Option Bot 2.0 analyze the most current market trends and then suggests signals for traders. Again, we are not 100% satisfied with this service as the has been no proof that traders have earned any decent profits with this trading software. Also, since it is not fully automated, one has to have a fairly extensive knowledge of how to trade with binary options in order to be able to even utilize the software. To get started with Option Bot 2.0 you must create an account, register with one of their brokers and after making an initial deposit, you can begin trading. There is a 7 day free trial for Option Bot 2.0, however once the trial expires if you wish to continue using the system, you must pay $97 for unlimited lifetime access. This might be a reasonable price to pay for a lifetime membership if the service were actually able to achieve the results it promised. Is Option Bot 2.0 a scam? While we can not say with full certainty at this time that Option Bot 2.0 is a scam, we do not recommend this trading system to anyone who is serious about trading binary options. There have been far too many negative reviews and customer complaints regarding this system. Traders have claimed that despite the 60 day money back guarantee that is promised by this service, they were not able to even get a hold of anyone to inquire about getting their money back. This leaves a bad taste in our mouths and makes us suspicious of this sincerity of this trading system. We strongly advise that you opt for a more trustworthy trading system. There are plenty of automated and manual systems available online for traders of with all degrees of expended in the binary options market. 7 Binary Options review: Option Bot 2.0: 1 stars. 2.0? Is there a 1.0 I should be aware of? What are the more important things one needs to look for in a broker if they want to trade binary options successfully? What are some of the considerable factors one should be checking out if they want to trade with a reliable broker? Any way of knowing it’s 100% reliable? Nice to see that we have so many Canadian traders here. For those who are trading binary options in Canada, which broker would you recommend and why? Most of my Canadian friends are trading with binarymate, but maybe there are better options out there.